I just need some guided labs that I can do at home with my equipment. So I thought about how you could use GNS3 WorkBench exercises to do just that. In each lab’s folder, look for the Instructions folder, and open instructions.html. Then you’ll have your instructions for your lab. 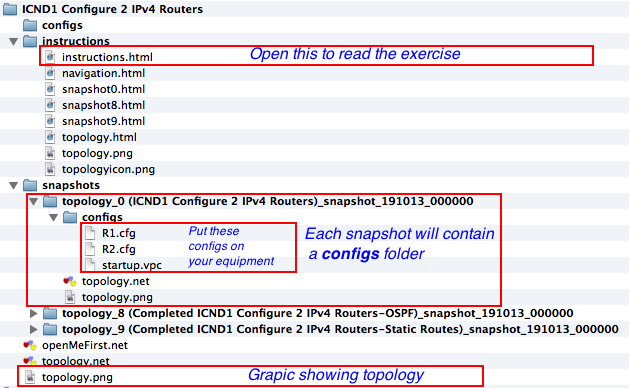 Note that the lab will hav a series of snapshots – each snapshot in a folder with a name like topology_x (description). Let’s start witht he topology_0 …. folder, and find the configs folder within. Just configure you home lab to look like the topology (which is also shown in topology.png) and paste the configs for (in this case) R1 and R2 into your routers, and look at the startrup.vpc file to see what IP addresses you need to give your PCs that are attached to the lab. You will also see topology folders that contain the final configs so you can check your answers. In some cases, the instructions will have some hints or workthroughs too. 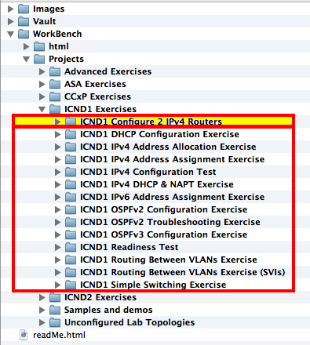 The lab that I most highly recommend is the ICND1 Readiness Test. Click on the link for more info. This entry was posted in CCNA, dynamips, GNS3, GNS3 WorkBench and tagged Certification, Cisco Systems, Dynamips, GNS3, GNS3 WorkBench. Bookmark the permalink. Do you plan to move to 1.x gns?